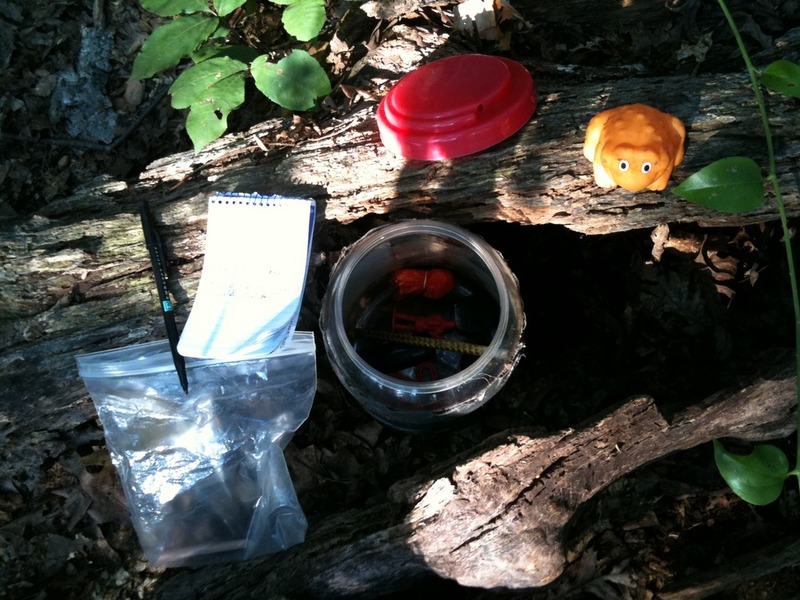 Geocaching — it’s all about the SWAG! Geocaching is the high-tech sport where you are the search engine! A handheld GPS receiver and a hunger for adventure are all you need to play this 21st century version of hide-and-seek. I have been a “Basic Member” since 09 August 2003. Initially, I was interested in one type of cache known as a “Locationless (Reverse) Cache”; locationless caches morphed into what is now known as “Waymarks.” Waymarking is “a scavenger hunt for unique and interesting locations” around the world; I follow the RSS feed for the Sundials category. My geocaching username is “Geodialist,” a hybrid name that reflects my combined interests in geocaching and sundialing. The first geocache I found is a traditional cache named “White Oaks Hollow,” hidden in White Oaks Park (see Photos 2-3, below). 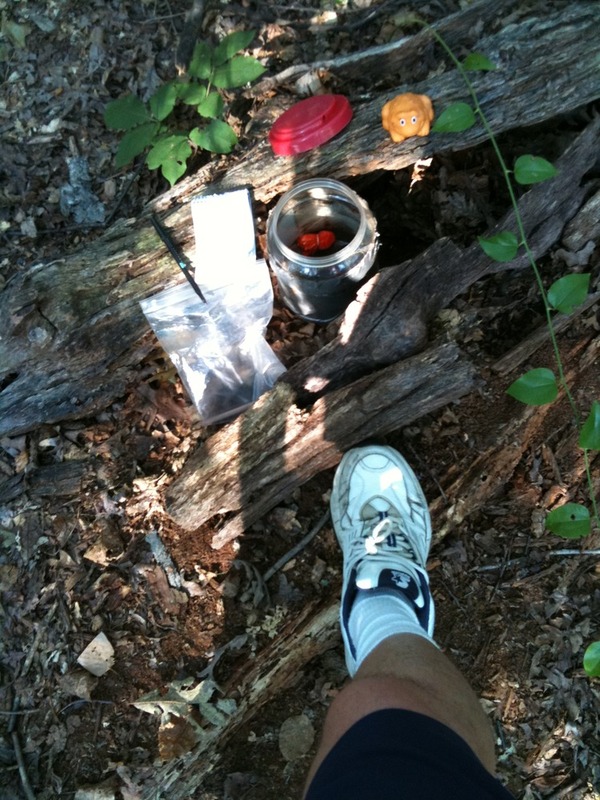 The first time I visited the site, I was within four feet of the cache location but could not find the cache container! I revisited the site a few days later and found the geocache right away. I signed the logbook, exchanged trade items (a.k.a., SWAG), and left the cache as I found it. Later, I used the geocaching.com Website to log my find. For me, geocaching is all about the SWAG. SWAG? “SWAG” is an acronym with many meanings, such as “Souvenirs, Wearables And Gifts,” “Stuff We All Get,” and “Sealed With A Gift.” Photo 1 of 3 in the preceding gallery shows several trade items I took from three geocaches I visited during the past year-or-so. 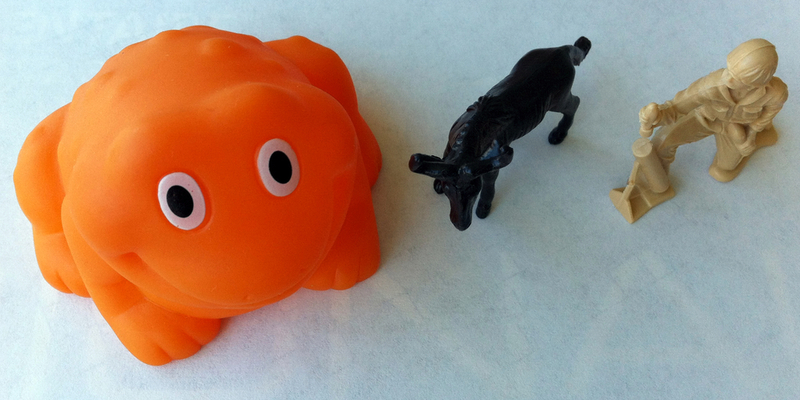 “Senor Frog,” as I refer to him affectionately, is my favorite geocaching SWAG item. Be sure to give as good as you get when find a geocache! Tech Tips: I used “Geocaching Intro,” a free app for Apple iPhone, to navigate to the geocache location. The app is location-aware: It suggested several nearby geocaches I could try to find; I chose “White Oaks Hollow.” Geocaching Intro provides a quick introduction that answers the fundamental question, “What is geocaching?” The app works well, although it would be nice if its skeleton feature set were fleshed out with more of the bells and whistles that come with the commercial version that retails for $9.99 (a relatively high price point for an app).